Taking a deep breath through the nose may seem relaxing. 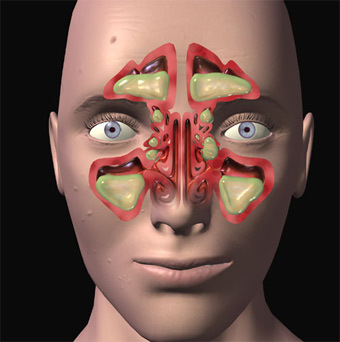 However, most of us never think about our sinuses when doing so. But, for others, these tiny air passages are a source of stuffy nose and headaches, associated with fever and infection, which, in serious cases may last up to twelve weeks at a frequency of four times a year. As per the ayurvedic approach, Sinus problems are caused due to underlying imbalance in Prana Vata (the sub-dosha of vata that govern the head, brain and mind) and Shleshaka Kapha (sub-dosha that governs moisture and lubrication balance). Air pollution, lifestyle pattern, alternating between hot and cold weather, consuming excess amounts of cold, heavy or sweet foods, lack of sleep, insufficient exercise, could all further aggravate the imbalance. Follow a diet that pacifies Prana Vata and Shleshaka Kapha, and follow a Vata-Kapha pacifying diet. The foods consumed should not be too hot or too cold. Avoid ice-cold foods and beverages. The foods consumed should be warm, light, nurturing and easily digestible. A combination of spices such as turmeric (2 parts), cumin (4 parts), coriander (4 parts), fennel (4 parts), ginger (1 part) and black pepper (1 part), could be roasted and then ground into a powder. The ground spices could be sprinkled on to vegetables or grains, or added to your soup and consumed. Steam inhalations performed by adding eucalyptus oil, garlic, cough drops or other medicinal herbs to boiling water will help reduce sinus headaches. Drinking plenty of water, flavored with spices, will de-tox the sinuses and purify them. Boil two quarts of water. Add two leaves of basil, two thin slices of ginger, four mint leaves, two pieces of clove and quarter-teaspoon of marshmallow root. Drink this combination, all through the day. Eat plenty of organic fresh fruits and vegetables. Avoid banana, eggplant, bell pepper, tomato, as these clog the channels.Avoid skipping or delaying meals as this will upset digestive balance and cause formation of toxins. Regularize bowel movements, as this helps detoxify the body, apart from re-establishing a balanced environment in sinus area. Other herbal supplements such as the ‘Protection Plus – Sinus’, could be taken on consultation with a physician, as it helps maintain sinus health and boosts resistance to infection, apart from reducing inflammation.